Here it is the end of August, and not one post this month. My apologies. My previous posts suggested a need to reinvent myself, or my work at any rate. And that is what has taken up most of my time – not the producing part, but everything else: reading, surfing, talking, thinking, imagining, visualizing, all just to grab a wisp of inspiration. In the end, there were two designs that inspired me to use as a jumping off point and attempt to transform a new concept into a woven form. 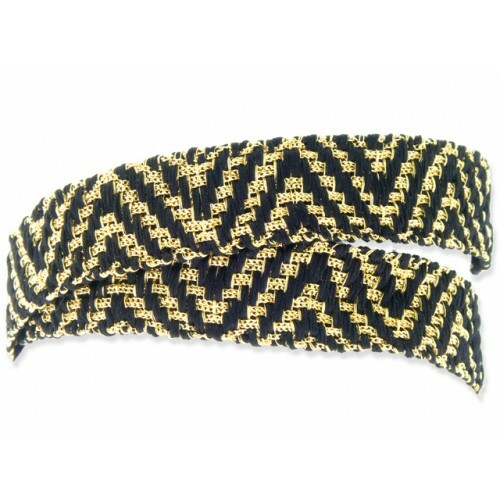 18K gold bracelet handwoven on a traditional loom with gold threads and black silk in a twill pattern. By Carolina Bucci. As soon as I saw this, I fell in love with this bracelet. 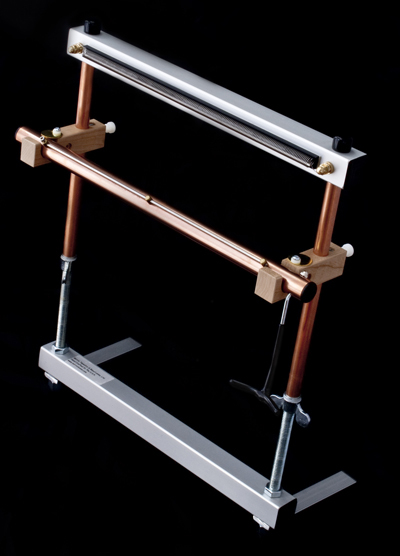 This is from www.portero.com and sold for $2,200. That would be a nice income for a handweaver, a handweaver who could easily recognize the point twill pattern in the design. I set out to warp my Baby Wolf loom with a 6 Harness point twill in a black perle cotton yarn. 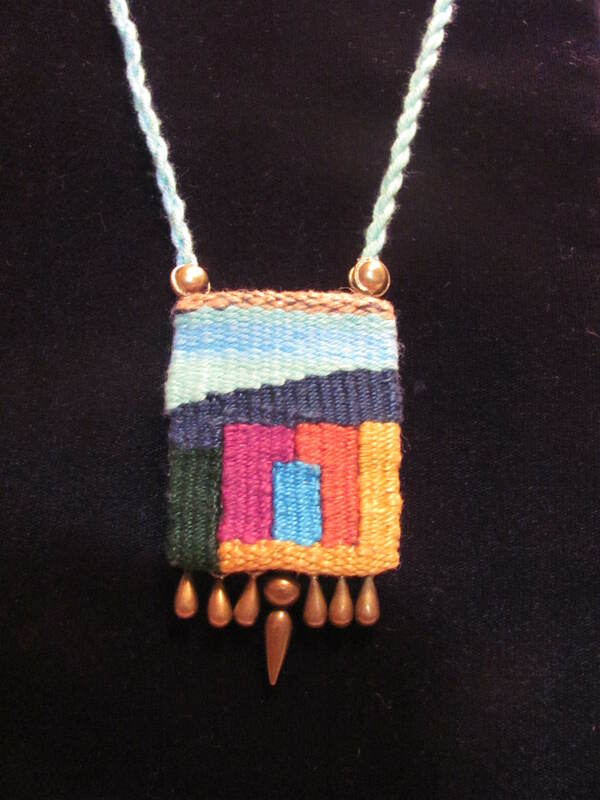 I used colorful novelty yarns in the weft. (Didn’t want to use the 18k gold yarn for this first effort.) These are my results. Not a bad first try. I am quite happy with the finished bracelets and am looking forward to playing with it some more and tweaking the pattern, the fibers and the shape. Now my other inspiration came from Memphis artist Dawn McKay. She and her partner Shannon Cable are shoveIt designs. This is how they describe their work on their website: “shoveIt designs transform broken skateboards into wicked wearable art.” Now I am not at all familiar with the construction of skateboards, and don’t think I’ve ever been up close and personal with one. My generation after all still used skate keys for our roller skates – the one with 4 wheels on each boot. 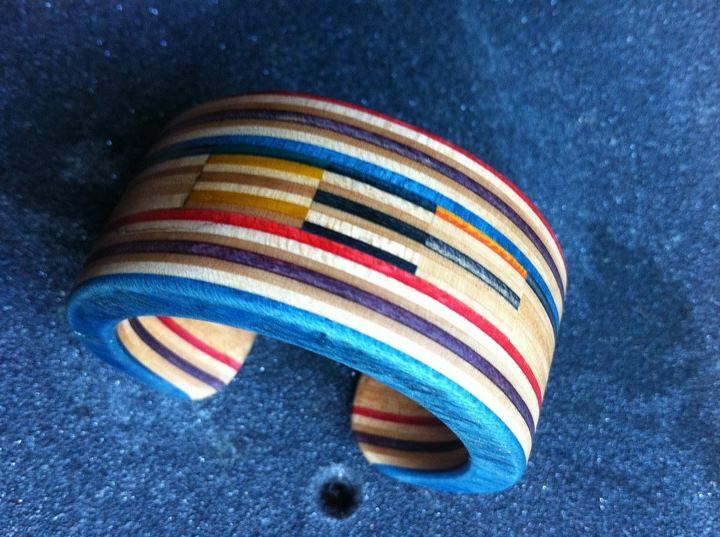 So I was pleasantly surprised when I saw this deconstructed skateboard that Dawn transformed into a bracelet. 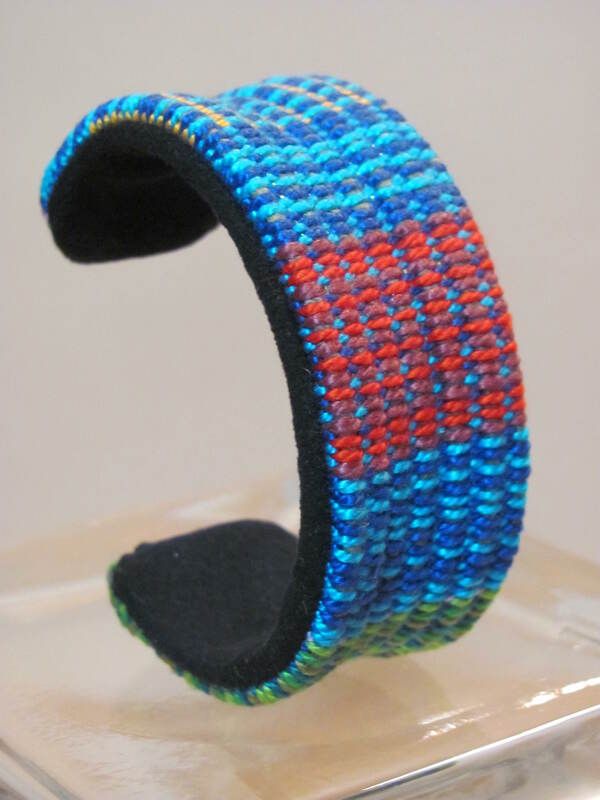 Cuff bracelet made from a broken skateboard. By Dawn McKay of shoveIt designs. This was another example of love at first sight for me. And as you all know, I have been playing with rep weave designs on my loom lately, and saw that the pattern in this broken skateboard represented rep weave. 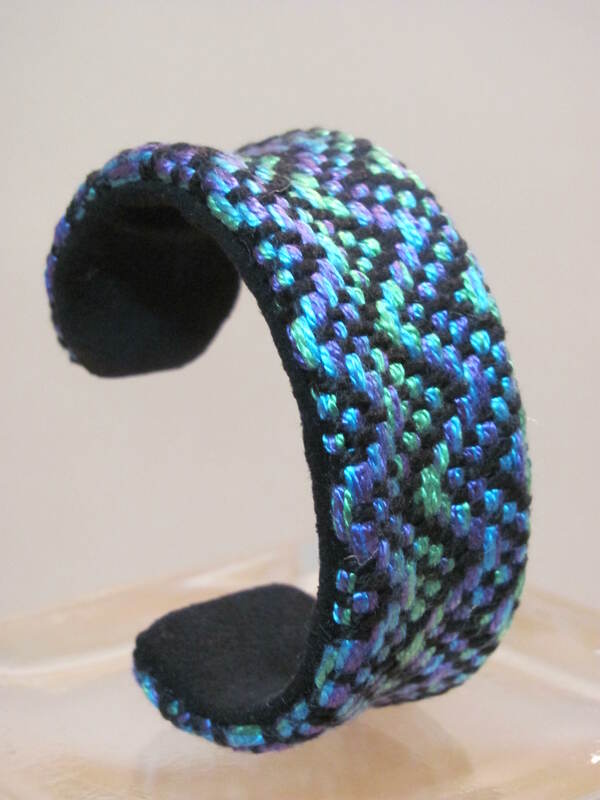 Here is my cuff design in a rep weave pattern inspired by shoveIt designs. 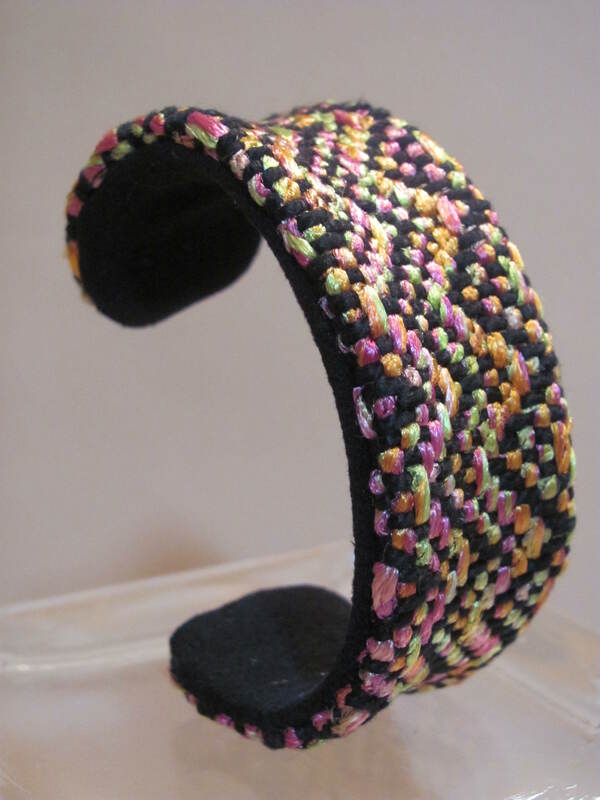 Creating these bracelets was like my “Aha moment”. This was what I had been searching for all along. But it doesn’t end here! I have had my eye on a certain lovely all metal tapestry and beading loom for a long while now. The looms are made by Mirrix Looms based in New Hampshire. So I took the plunge and purchased the “Big Sister” model. You ask, what am I going to weave on this loom? More jewelry of course! 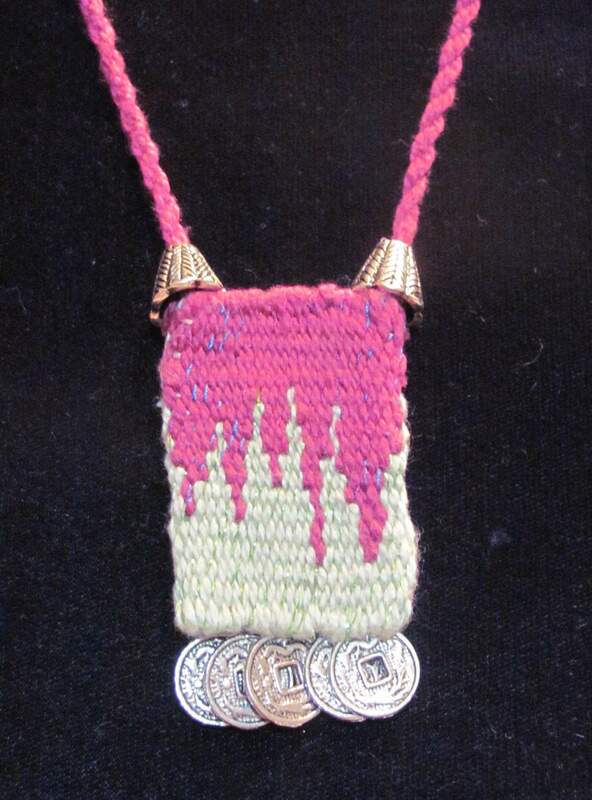 Here are a couple of handwoven tapestry pendants that I wove on my new loom. So here it is, the end of the summer and I am finally having fun!